Going to university can be really exciting. It can provide some amazing opportunities and lifelong friendships. Leaving home and moving to uni can also be really hard; the majority of students will feel anxious about leaving home and finding their way around a new city. We know that it can feel like even more of a challenge when you’re battling an illness such as depression, so, we’ve pulled together a list of things which will hopefully help to smooth this transition a little bit and make things feel slightly easier. Familiarise yourself with the support available to you at your university. Every university should have a page on their website listing the mental health support they offer – it might be under ‘welfare’ or ‘disability’ – have a quick read through it before you enter a jam-packed Fresher’s week, so you know what support is available should you need it. Consider applying for Disabled Student’s Allowance (DSA). If you have a diagnosed mental health condition, you can apply for DSA which can help you to access any extra support you might need, such as a mentor to help you manage your work, or extra time during exams. Register with a GP near your uni. You can often do this online before you arrive at uni but if you can’t, then try to do it during Fresher’s week. It’s much easier to get a GP appointment at short notice if you’re registered at the surgery. (If you’re not registered there and you really need to see a GP, you should be able to register on the spot, or register as a temporary patient; it’s just a bit more hassle!). 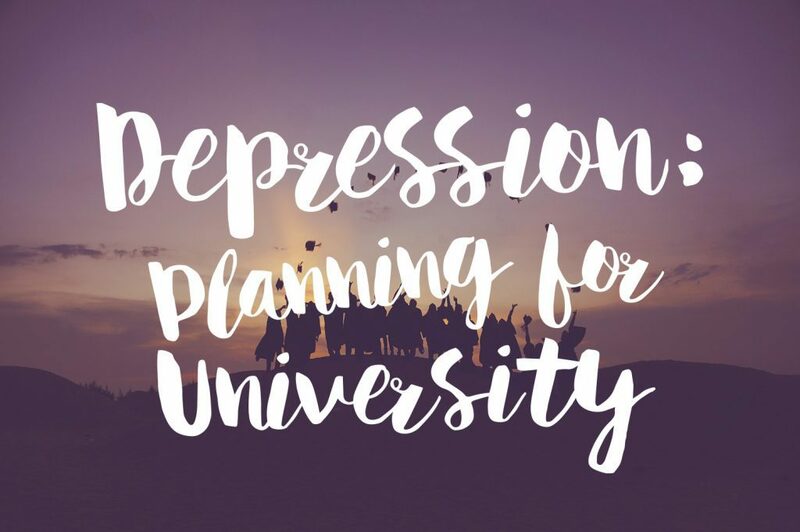 If you’re on anti-depressants, or any other regular medication, it’s a good idea to fill your prescription before you go to uni, because it can take time to get a GP appointment at your new surgery, and order a repeat prescription. (If you don’t manage to do it, or accidentally leave your medication at home, it’s not the end of the world because often chemists and GP surgeries will do their best to help you if that happens). If you think it would help, you can ask your current GP or mental health team to write a letter to your new GP or mental health team. It might help you to feel less anxious when meeting new professionals and could mean that you don’t have to go through your entire mental health history every time you meet a new person. Be careful when mixing alcohol with your medication. Alcohol can be a big part of uni life (especially your first week! ), and there is no problem with joining in with everyone else. Just be aware of how it might mix with your current medications – it might be that alcohol has a greater effect on you than it would if you weren’t on medication, for example. HeadMeds is a great resource, showing how many common mental health medications mix with alcohol (and other areas of student life). If you decide not to drink, that’s absolutely fine, too! Many students don’t drink, in fact the number of 16-24 year olds deciding to remain teetotal is rising. Don’t worry if it looks like everyone else is having an incredible time, and you feel like you’re not. Other people’s Facebook photos show a small window of their week, when they were out and about, smiling for cameras. They may well have got lost on campus that morning, they might have felt homesick that afternoon. Facebook doesn’t show the whole picture. Decorate your room to try and make it feel a bit more like home. Bring your favourite teddy(s) and your most comforting blankets and bed sheets. If you find smells comforting, find a diffuser you like the smell of. Bring some posters, photos or letters – most uni rooms have somewhere for you to put up your bits and bobs. Try to get into a sleep routine. It’s really easy to stay up super late watching Netflix (with no parent to tell you to go to bed! ), and to roll out of bed around midday (with no school to get you up), but it’s not always helpful. Try to eat a relatively balanced diet. There is nothing wrong with the odd pot noodle or takeaway pizza, but food can impact your mood, and if you never encounter a piece of fruit or a vegetable, it might make you feel a bit rubbish. Plan your time, especially around exam season. You can’t work at full pelt, all day every day – nobody can. Take regular breaks and give yourself time to relax. Make sure you’re allowing yourself to sleep, and allowing yourself to cook proper meals, even when uni work gets stressful. It’s really hard to concentrate if you’re tired, sleep-deprived, or hungry! Keep in touch with your family and friends. Not living with them any more doesn’t mean you can’t speak to them. Texts, Skype, and even letters are a great way to help combat loneliness and homesickness, especially in your first few weeks. If you feel like things are slipping, reach out for help. Contact your supervisor, your uni counselling service, your GP, or any other welfare support available at your university. They’re there to help and you won’t be the first or only student that’s ever needed them. Look after yourself! You are important, you matter, and your health is more important than any university grade. You can download our handy self-care starter kit which has lots of great ideas for being kind to yourself. If you find that you’re beginning to struggle and want to find some more support, there are lots of services that should be able to help. Most importantly, please remember that you are not alone in this. Around 20% of students have a diagnosable mental health problem. There is support out there; try to reach out for it if you need it.